pretty.pretty.paper: my shorts don't fit. over the weekend we did a little bit of celebrating. mas is one year older and i am about ten pounds heavier. we had crack pie, times two, and chocolate cake. 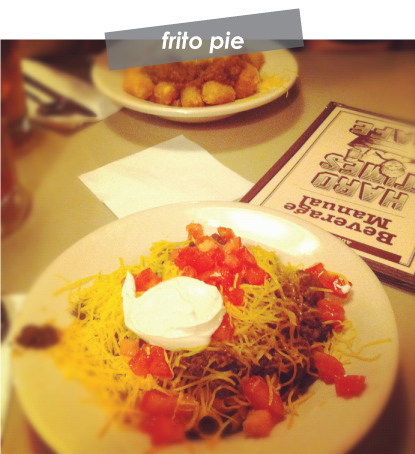 also we went out with a dear friend saturday night and found ourselves eating frito pies (oh and tater tot pies) at two in the morning. it was fun, but let me tell you, sunday i woke up and thought i might die. we converged in the kitchen for breakfast around 11, so late for me, had oatmeal because no one could stomach the thought of even eggs, and then we sat, drank water/coffee/orange juice, and attempted to rehydrate. at 1:30 we went on a twenty mile bike ride through the city, it was warm. at 4:00 we were cleaned and STARVING. we headed down the street to have sliders and pizza (hello healthy, i know). i was a zombie. it was my first actual bike ride in about a year and it was SUNNY. i hate the sun, it drains me, so does biking for that matter. i had a slider, some salad and a piece of peperoni pizza. they boys had three cocktails a piece and the rest of the food. they were fine, maybe that was my mistake, no cocktail. around 6:00 we ended up back home and the weather outside was lovely. mas was suffering from an oncoming benadryl coma and i was just suffering from the past 24 hours. we took a sheet, the dog and a bottle of water three doors down to the little triangle of a park. we slept for an hour. then we came home, mas took another nap, and i figured out that those shorts i purchased in january are far from comfortable. apparently my lifestyle of eating a lot and exercising not at all is catching up with me. long story short, mas and i had a discussion about diets and personal challenges and exercise. turns out we disagree on just about everything (except for the fact that a diet is NOT THE ANSWER, we both agree that is the case) and doing this together doesn't seem to be the best idea. so, he's going to bike to work and exercise more and i'm going to run every day (yeah right) and stop eating solids. i kid, i kid, but maybe i'll not keep corn cookie dough in the freezer any more. I've been having this issue for nearly 2 years. Basically moving to Durham made me gain a ton of weight. I've got the diet portion mostly under control, but I HATE EXERCISE. So you know. That's bad. I just ordered some new ballet dvds. Hopefully that'll help. I have the same issue. After taking a desk job about 3 years ago, I gained about 10-15 pounds. Since I quit the desk job, I really have no excuse any more. But the whole eat-better-and-do-a-bit-more-exercise thing doesn't really work for me (tried it for a long time and I guess my body just re-adjusted to this stupid weight). Our friends just bought P90X and asked if we wanted to do it with them. Come to find out, I'm a bit of an exercise masochist (whooda thunk?). Almost a week in and I LOVE IT. I cannot WAIT to do it each day, and I'm already feeling about 102340923580938 times better. N is enjoying himself, too. HE EVEN LIKES YOGA NOW. So hopefully that'll work. Tater Tot Pie?! What is that? It sounds delicious. Oh girl, I feel ya. I gained a bunch of weight finishing up grad school, and I can't seem to shake it. It kills me that all my summer dresses are now too tight to be comfortable/appropriate. so much food i need a special dress. getting there // living room.